The word [bot] is tricky for a search engine, because it’s ambiguous. You could mean the larva of a botfly, you could mean a malicious software program, you could mean a friendly chatbot. At the end of May last year, I wrote a post about what Google was telling people who Googled “what are bots?” It wasn’t super flattering, mostly because Google was operating off of an outdated understanding of what “bots” referred to. Back in May, the search engine results page (SERP) was heavily skewed towards a negative understanding of bots as internet applications that were malicious, e.g. botnets, spam bots, etc. Google attempts to “understand” the world based on its Knowledge Graph, instead of simple querystring matching. Essentially, they’re trying to model a more complex understanding of the world based on the people, places and things in the world, and the relationships that exist between them. Google has retained the featured snippet that defines “bot” in the context of a botfly larva. 5 of the 11 main elements on the page remain the same, if slightly reordered. The other 6 SERP listings are new, and reflect a new understanding of the likely user intent around the query. So we can see that Google has changed over 50% of the page, based on changes in how the word “bot” and related terms are being used in popular culture. So, we can see that sentiment has changed, but it’s hard to summarize exactly how. There’s slightly less anger, disgust is unchanged, fear has gone up (but is still a small absolute value) while joy and sadness have both jumped a LOT. The fact that there are such large increases at both ends of the spectrum (joy and sadness) is simply a reflection of the emotionally charged language that surrounded bots in their first big, breakout year. Suffice it so say, feelings are complex, and anything as simple as a sentiment analysis tool operating on a couple of hundred words is going to have a hard time making sense of things. To see trends in search activity, we can use Google Trends to check [bots] and related terms, and we see searches have been increasing, especially for the search term [chatbots]. In March 2016, I also looked at where these queries were coming from. A year ago, Southeast Asia predominated, and that’s shifted somewhat to Australia and South America. North America barely cracks the top 10. If we pull the focus out to more general topics like [artificial intelligence] it gets *fascinating*. I love it when data makes me think about the world a bit differently. 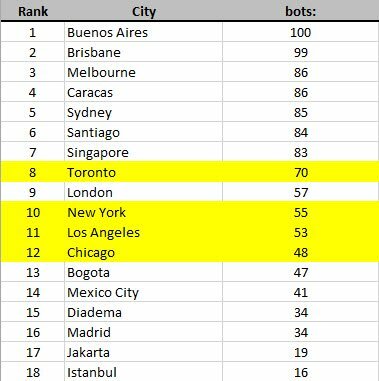 When an American tech capital barely breaks the top 20 for a search term like “artificial intelligence”, and you factor in how massive these other metro areas are, it makes me realize how far beyond the boundaries of Silicon Valley we should be looking for groundbreaking innovation. Granted, this is Dec 2015 data, so those numbers will have moved. But what I like about this view of the data is that it is representative of *average* usage across all Android users. So, we’re not comparing how much time Kik users in the U.S. spend in the app vs Kik users in the U.K. We’re looking at usage of messaging apps across the population. Brazil and Mexico combined have about the same population as the United States (200MM + 122MM ~ 325MM). 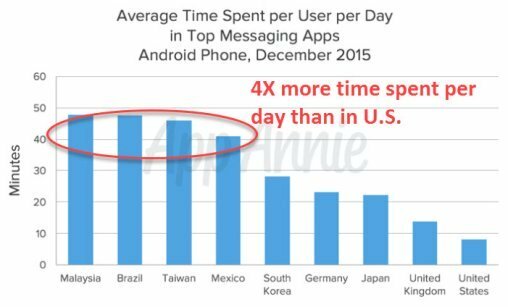 If users in those countries are spending 4X more time in messaging apps, maybe your best audience of enthusiastic early adopters isn’t in the U.S. Interesting research. 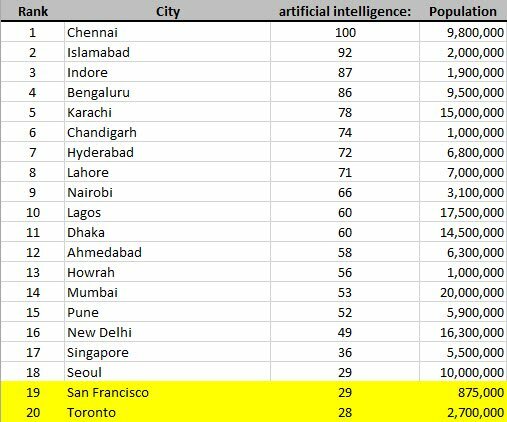 It’s really weird that top countries for “artificial intelligence” are Chennai, Islamabad etc. By the way I looked in Google Trends India – it was peak of activity in late February and there were some spikes of activity already in 2012-2013!